Cardisure There are 4 products. Cardisure (Pimobendan) is available in capsule and palatable tablet form and in the following strengths: 1.25mg Cardisure, 2.5mg Cardisure, 5mg Cardisure & Cardisure 10mg. Cardisure is a drug that is often prescribed for dogs to treat a range of heart conditions and is associated with significantly improved survival times. Cardisure opens up, or dilates the blood vessels that carry blood to and from the heart. This means that the heart doesn't have to work quite as hard to supply the body with oxygen. Cardisure also improves the ability of your dog's heart to act as a pump and improves the contractility of the heart muscle. How will Cardisure Help my Dog? Cardisure can help reduce the signs of heart failure, lead to a less tired and more active dog and significantly increase the lifespan of dogs in congestive heart failure. Owners generally report that their dog's quality of live dramatically improves following treatment with Cardisure. A recent global trial called QUEST showed how Cardisure can help prolong the life of dogs suffering from heart failure relating to underlying mitral valve disease. Another study documented the way in which Cardisure can prolong the life of Dobermans, suffering from dilated hearts (or DCM). Are there any side effects that my dog might experience whilst taking Cardisure? Cardisure is generally tolerated extremely well. On rare occasions, gastrointestinal side-effects may be seen such as vomiting or diarrhoea. If this happens or you are concerned about your dog for any reason, please contact your vet for advice. Cardisure is used for the treatment of canine congestive heart failure originating from dilated cardiomyopathy or valvular insufficiency (mitral and/or tricuspid regurgitation). 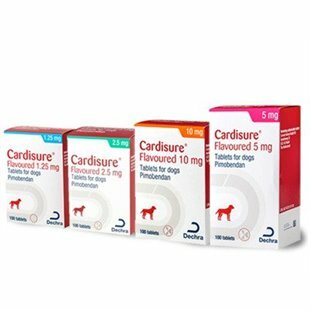 When Cardisure is used in cases of valvular insufficiency in conjunction with frusemide the product has been shown to improve the quality of life and extend life expectancy in treated dogs.